This is a photo taken almost 2 years ago in a little village not far from home and it is on my flickr stream. Once in a while I check the links to people who have liked or favourited my pics and who are not my contacts. So a few days ago my roses were favourited by Yang Yang Pan, and I look her up to see if she is real, and oh yes, she is an artist … born in China and now living in Canada. I cannot access her website as I write this post so check her Etsy store (it has a link to her site as I guess it is just down temporarily). She makes lovely cool stuff. Birds, a photo by D Laferriere on Flickr. on sandwiches. 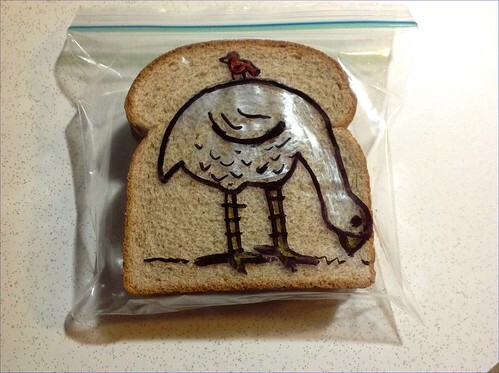 David Laferriere has been making Sandwich Art since 2008 decorating his kids’ sandwiches with cute little drawings. You can see David Laferriere’s whole set of Sandwich art here. More Cornerviews about birds starting at Francesca’s Fuoriborgo. in April … because flowers were this month’s theme in the flick group La Vuelta al Mundo. All these shots are from last summer in Vienna at this event. There was a lot of waiting, so to make time pass, I was photographing the people in front of me and especially the very different earrings of the women. And why I post them today? Because today is the last day of the month and because People from behind (Gente de espaltas) was the assignment for September in the flickr group La Vuelta al Mundo.